Happy to announce I would be hosting my blogger friend Valli's event : Kids Delight from 15th May -14th June 2017. The theme would be Summer Coolers. 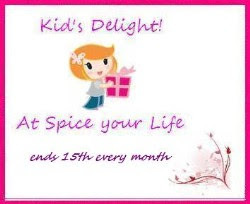 I'm hosting this Kids Delight with Summer Coolers which is a famous category for both moms and kids. All bloggers and non-bloggers are welcome to participate. The Coolers must be kid friendly, tasted and approved by kids. Thank you so much for visiting my blog. I appreciate your valuable comments and suggestions to improve this further. Please visit again for more recipes and updates.